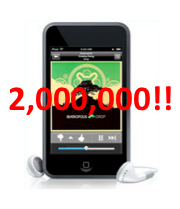 At 10:04am this morning we hit 2,000,000 registered iPhone Pandora users! We’re hearing all sorts of wonderful feedback from listeners who are using it on their commute, jogging with it, plugging it into home audio systems…you name it. And as usual, offering all sorts of great feedback and suggestions. It’s thrilling for us to see the broader vision for Pandora take shape. Our hearty thanks for your continued support and input. This is an impressive milestone for Pandora, but also highlights the growing importance of the iPhone as a platform for social media applications. Pandora is awesome – I like that it lets you create your own stations and it actually works on the Edge networki.